Heads up: some of the links in this traffic & income report post are affiliate links and services I use for House of Nash Eats. Hi there! 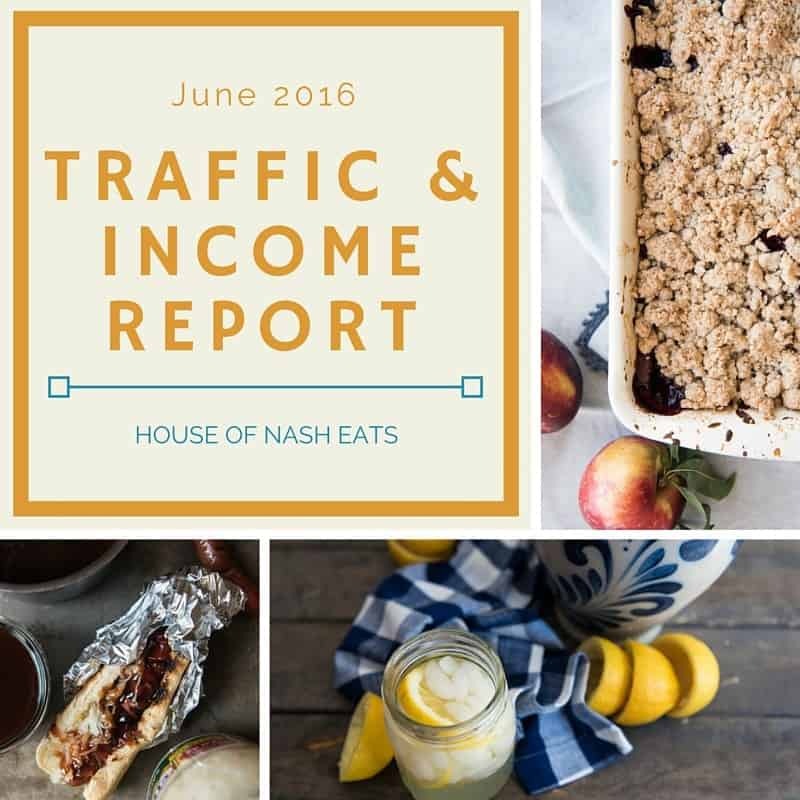 Welcome to the first monthly traffic & income report for House of Nash Eats! This is where I plan on sharing some information about the nitty gritty of blogging, starting and growing a food blog, and attempts to monetize a food blog. If the behind-the-scenes side of blogging doesn’t interest you, I get it. You’re probably here for the recipes, right? Something delicious is coming this way soon. But if you are a nerd like me and want to know about what goes into food blogging, read on! 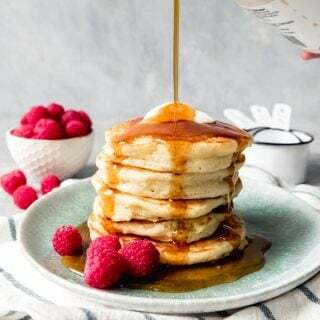 When I started getting serious about creating a real-deal food blog, I began to notice a number of blogs that posted these monthly traffic & income reports (Pinch of Yum and Show Me the Yummy were particularly interesting). They detailed metrics over the previous month that they evaluated in terms of what was or was not working to grow their blog and make an income from their blog. I have no illusions of grandeur with my little blog, but it would be awfully nice to earn enough money from monetizing this blog to fund a photography class (or 2 or 3). 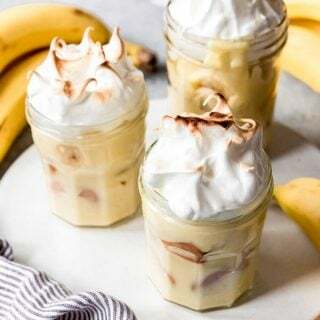 I figure I would be working on this blog and posting recipes anyway as a hobby, so why not try and earn a little something to fund the hobby while I do it? I debated posting traffic & income reports myself, but decided to share for a couple of reasons. The first is to encourage myself by having a way to look back on the progress of this blog and to see how it grows. And the second reason is to support other bloggers or would-be-bloggers as they grow their own traffic. It’s certainly helped me to see what works or doesn’t work for other people and how they’re growing traffic. And even if you are not a blogger, you might just find a behind-the-scenes look at blogging interesting as well and feel inspired to start your own blog. So, without further ado, here’s what has been going on behind the scenes in June. June 2016 was my first month blogging, and not even a full month at that. I launched the blog on June 8th with this post for blackberry nectarine crumble. 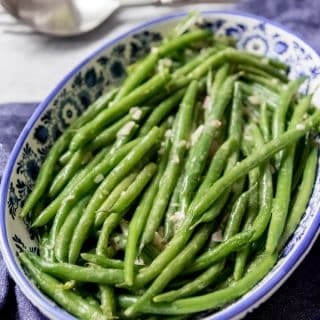 I posted 12 recipes in June, with the aim of posting new content 3 days a week, typically on Monday, Wednesday and Friday. Things were pretty quiet for the first two weeks while I posted content and mostly just worked on sorting out the design and backstage aspects of the blog. Then on the 21st I went ahead and posted a link to the blog on Facebook, just to let friends know about it in case any of them were into reading food blogs and to get the ball rolling with a little traffic. 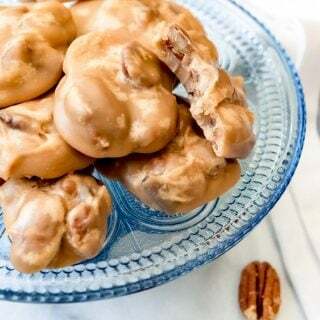 I also started submitting images to a few food photo submission websites, created social media accounts for the blog, and started using hashtags to build a bit of a social media following. The Pinterest number is inflated because I just transferred my original personal pinterest account into a business account so I can access some of the additional benefits Pinterest offers like analytics. Obviously I didn’t have a huge Pinterest following to start out with but as far as organic growth on Pinterest goes, I think it was maybe more like 15-20 new followers for the month of June. I’m very happy with the Instagram growth, as a couple of the photos I posted on the House of Nash Eats Instagram account went semi-viral (for me) on a super small scale with the hashtag #yumgoggle, which put it in the top grid of those hashtag results and ended up with 150+ likes and numerous followers just off the image of belgian waffles with nutella, strawberries and cream. I had 5 photos accepted for publication on Foodgawker.com (and a couple of photos rejected too) and 1 photo accepted on Yumgoggle. I definitely saw an increase in traffic as each image was published and plan to submit much more regularly and to more photo submission sites for the month of July. Here are some screenshots from Google Analytics for the month of June. Total traffic for the month of June, including how many users, page views, and sessions. For really only having 10 days of anybody knowing about the blog, 1,264 page views is nothing to scoff at. Granted a big chunk of those numbers are probably family and friends who clicked through because they saw me post about it on Facebook or Instagram, but it was a nice boost both to my ego and my stats. The only reason I know of that page views are important (you know, besides making the blogger feel good about themselves and the hard work they put in creating good content) is that ad networks won’t work with you unless you’ve met certain levels of page views. You need traffic to see those ads and that’s how you get paid. 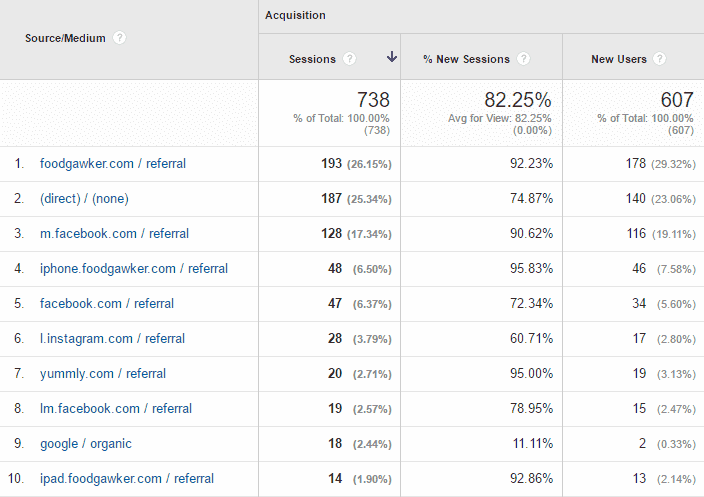 Foodgawker was my #1 referral source during my first month of blogging. Even more than “direct”, which was my number two and really means people who actually came directly to the blog because they entered the web address rather than finding it organically. The sources that are most interesting to me at this point are numbers 7 and 9. 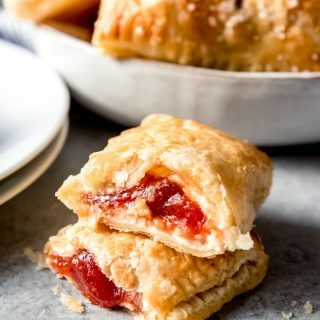 Yummly is a recipe sharing site (sort of like Pinterest but food specific) and when a post gets “yummed” by clicking on the little orange “Yum” icon in the recipe post, it gets saved to a “recipe box” on Yummly and then gets re-yummed by other Yummly users. I’ve heard good things about traffic coming from Yummly so I would love to see that increase in July. And #9 is traffic coming from people googling something and then stumbling onto my blog that way. It’s where search engine optimization (SEO) comes into play and is something I want to work on these next few months. Like I mentioned before, I had some success driving some traffic to my site using a food photography submission site. So I plan to up my game in July by submitting to more food sites. The ones below are all on my radar as places that might be good for me to submit to. It takes awhile to fill out all the required information and upload images on each of these sites, but it’s exciting to see other people showing interest in your recipes, and seeing as how my following is so small as a brand-new blogger, I’m going to keep doing it. 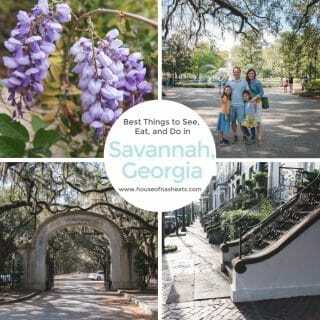 Tastespotting – 3 photos submitted but all are still pending and I’ve heard this site might be defunct. I know that making a profit from a blog is possible, but it takes a long time and a lot of work to get to that point. Clearly, I’m going to be spending more money on blog related products and services than I’m making from the blog itself for a while as I build traffic and focus on creating worthwhile content. You have to build your audience and by doing that, you have to be consistent with blog posts! Which I am working towards by creating a reserve of posts such that I can post 3 times a week and still have 2 weeks of content in the queue as a buffer in case things get crazy in my life, which is totally likely as blogging is just my little hobby and my day-to-day is so busy! As I continue to grow this blog, I’m planning to seek out other opportunities to make a profit and am hoping to work with some companies to do sponsored blog posts eventually! Not a lot – I think once a month sounds just about perfect if I could get them. But on my growing list of things to do for this blog is to create a shortlist of potential sponsors to reach out to and see if I can develop a relationship that would result in a sponsored post. Improve the quality of my food photography. Create a full 2 week buffer of 6 posts in the queue at all times. Grow each of my social media followings. Look into how to create a Buzzfeed post and create and submit my first one. Develop relationships with other food bloggers. Create an e-book with either recipes or photography or travel tips and make it free for download when someone joins the mailing list. Increase my monthly traffic to 30,000+ page views/month by the end of 2016. Become profitable so that I cover all my blogging costs with income from the blog and start making a little extra for something fun! Do a tutorial-type post on a topic with step-by-step pictures. Learn about SEO and keywords to develop that google/organic referral source. Do some research on how to optimize my Pinterest account and pinning habits and make beautiful vertical pins. 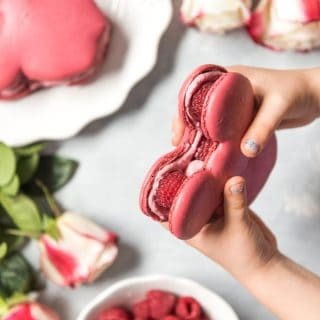 Comment on other food blogs as a way of connecting with other food bloggers and making blogging friends. This sounds silly but when we were going through the adoption process, the relationships I developed with my online adoption friends were invaluable and many of them continue to this day and my life is richer for them. Participate in weekly Facebook food blogger social sharing groups that I am a part of. Schedule Facebook posts for at least 2x per day. Pin at least 15 pins per day. Honestly, I have had a blast starting this blog – the design and layout, the recipe creation, learning more about photography, making and definitely eating the food, getting educated on blogging in 2016 and seeing people engage with and enjoy my recipes. And I’m excited about all the things I have to work on in the coming months to make this blog even better. And there you have it! Thanks for reading this first House of Nash Eats income & traffic report if any of you made it this far! I really enjoyed writing this, especially as this is the part of blogging that I almost find the most fun since it sort of feels like a game in lots of ways. I’m looking forward to the next income & traffic report for July! Was this post informative? If you are a blogger, was it helpful to see what my Month 1 looked like? Let me know in the comments, especially if you are a newbie like me! Amy, thanks for sharing your report! My blog is only 6 months old so I’m right here with you thinking through all of the different ways to market and improve with each post. I have never heard of Yumgoggle before so you definitely gave me some new ideas to look at for my own blog. Keep up the great work! Thanks, Shannon! I just clicked over to your blog and can I just say that your http://www.passmesometasty.com/sweet-savory-pan-roasted-brussels-sprouts/ from April look awesome?! I gave you a like on FB too so I can follow along seeing as how my blog is just a little behind yours in age! Oh, and Yumgoggle has actually been super helpful for me so far because it is smaller, I think. At least, when I have used the yumgoggle hashtag on IG I have ended up in the top 9 a couple of times which brought me quite a few new followers! Thanks Amy for the FB like. : ) And if you try out the Brussels Sprout recipe let me know what you think! Happy blogging! Great job Amy! Looking forward to following along with your food blog adventure. Your off to a great start. Love the goals and love your blog! I’m going to look up the America’s Test Kitchen affiliate program – I didn’t know they had one. Thanks for sharing Amy! I think it takes such courage to post income reports. I like how honest and real you kept it. Keep it up! Thanks, Anna! Glad you found it helpful! You are doing such a great job and are trying so many different things! Your blog looks lovely! Hopefully it will head where you want it to go! I just started my blog in June, as well, and it’s helpful to compare my info with yours. I have only gotten one comment on my blog so far and see that you have so many comments. 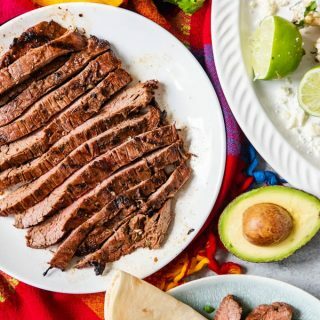 I am wondering if this is totally from food blogger pro, or just from general traffic but I’d like to know how you inspire comments on your posts. It would be real nice to have a couple. Thank you Amy, I just applied to join their group. A little concerned though, as it looks like there’s a lot of people who applied and their applications are still pending. I see no recent responses in their comment section under where I signed up so will hope they get to my application soon and that someone is managing new FB requests. Anyway, thanks also for visiting my blog. Nice of you to leave a comment! I hope I didn’t sound like I was begging you to! LOL! I think that the moderator is pretty on top of things – I was added after only a day or two and that was just a couple of weeks ago. And no, I didn’t think you were begging for a comment, lol. Those portabello burgers seriously just looked delicious and right up my alley!